I had promised myself I would check out La Moraga, as I have heard nothing but good things about these luxurious and stylish restaurants. When I ventured to the quite recently installed establishment (June 2010) on the top floor of El Corte Ingles near the copper tower in Marbella, I have to say – I was less than impressed. Firstly, the staff took ages to take our order – despite the fact that the restaurant barely had four customers – (my friend and myself included.) We were just about ready to walk out when a surly waiter came over to attend to us. Secondly, when I ordered an Iberian pork kebab and my friend ordered a warm cod and tomato “bocadillo” (sandwich) we were not informed that my choice would take significantly longer to cook and thus it was that my friend was almost three-quarters of the way through her chosen meal, eating very slowly (all will be revealed in a minute) before I attracted the attention of the waiter to complain. I was met with a half-hearted shrug as he informed me that my meal was taking longer to cook. On the subject of my friends meal, if it can even be called that – as when it arrived I was sure they had left some of it behind – it was barely larger than two fingers length and perhaps 2 and a half fingers breadth. Yes, I am serious. My friend commented on the fact, but being a rather tranquil sort, she started to eat without further delay. It was, she informed me, quite tasty… despite disappearing in just over two bites. Strike two came when my food actually arrived. The kebab was dainty and cut open so you could see the salad inside. It was arranged artfully on the plate, with a few lashings of some cream-coloured sauce. Thinking that it smelled absolutely delicious (it was sprinkled with cinnamon) I took a tentative bite and tasted…. well, absolutely nothing. The pork was fine, not tough, and more-or-less melted in your mouth – but the taste? Well, it didn’t have any! I couldn’t even determine what ingredients had been used in the cream-coloured sauce as it was so lacking in flavour it could have been just flour and water. Now, I don’t claim to be a haute cuisine connoisseur but I know when something tastes good and when it clearly doesn’t. While this kind of quality of food could be entirely acceptable in an economical, (but slightly grubby) menu del día café, here on what is essentially the “Golden Mile” of Marbella, I expected a lot more. Considering this restaurant is also the brainchild of one of Andalucia’s most renowned Chef’s, Dani Garcia, I cannot even tell you how disappointed I was. I suppose that’s what happens when you expect to be transported to the lofty heights of Shangri-La and crash land in the back-waters of Ghana. Needless to say, when the bill arrived, I didn’t leave a tip. From an aesthetic point of view I can assure you, it couldn’t be better – the restaurant was beautiful, with white tables and chairs, lovely place settings and stylish decoration. Unfortunately, this is not a place that should be judged by its cover… considering there is virtually no content. All this aside, I am not ruling out a visit to another La Moraga, as I continue to hear great things about the establishment in Banus and perhaps this particular one is not representative of all La Moraga’s within Southern Spain. Euroworld – Inflated prices begone! Oops Emilia, I do believe I was one of those who gave you the recommendation to go to La Moraga. Isn´t it always the way when you rave about something to someone, invariably they have a bad experience. Sorry!!!! I went there once over Christmas and have to say the food was good, but the service wasn´t what it should be. If you decide to give it another try, have the Pringu Croquetas and the Tripe and Black Pudding Stew, as they always seem to be good. If they don´t measure up, let me know and I will never rave about a restaurant to anybody again, ever, I promise. your comment had me laughing. Yes, you did recommend La Moraga to me but I believe you based your opinion on your dining experience in Puerto Banus – so I am reserving judgement until I eat there. Croquetas sound good, but anything with tripe in the title is a no-go for me. I know what you mean about raving to someone who invariably has a bad experience. I raved about a hairdresser once to one of my friends, and when she went there the hairdresser was in such a bad mood that day she burnt my friends scalp with the straightners. Twice. I will never take your advice when it comes to selecting a hairdresser, thats a promise. The tripe thing, well I honestly think you would be surprised. I just thought that you might like it, given that you seem to be the “Queen of Stews”. That title is meant to be a compliment, by the way! Well Mark, since you said it was a compliment – I shall take it as such – muchas gracias! Did you ever check out Patagonia? No, but I am looking at offices very close to there, so it may become my lunchtime hangout. 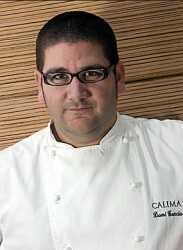 I hear great things about Calima in Marbella, pricey but good, apparently. I checked out Calima online, looks good – but slightly out of my price range for the time being.